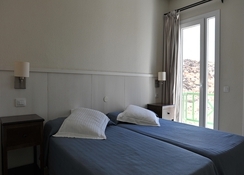 The family-friendly Guacimeta Apartments makes a practical base from which you can use to explore everything that the popular and lively island of Lanzarote has to offer. 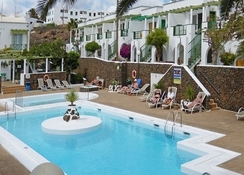 Located just a few minutes' walk from Lanzarote's famed beaches, the Guacimeta Apartments consists of luxurious Canarian style one-bedroom apartments, each boasting modern conveniences to make for a comfortable and relaxing stay. The location of Apartamentos Guacimeta in Matagorda puts it within stone's throw of beaches, restaurants, great shopping and so much more. There is no shortage of options for relaxing at the hotel, you can try the swimming pool or solarium, or how about hanging out on one of the hotel's hammocks? There is also an on-site restaurant serving breakfast, lunch and dinner and a mini-market, where you can pick up all your convenience items. 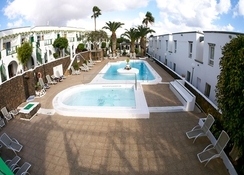 Guacimeta Apartments is situated just 3.7km from the Lanzarote Airport and a short walk from Matagorda beach. There are a variety of restaurants and bars very close to the beachfront, which provide sensational views across the sea and with a short car journey you can reach family-friendly theme parks, water parks and memorable cultural experiences. 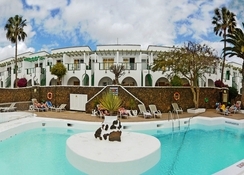 Guacimeta Apartments has been designed with typical Canarian flair, adding a distinct style that sets the tone for a fantastic Lanzarote holiday. The interior of every apartment is designed to make the most of the sunlight, utilising large floor to ceiling windows. 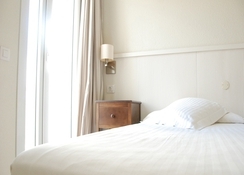 Apartments include a kitchenette, televisions and tea and coffee making facilities, while many rooms are available with either a balcony or terrace and cater to families of varying sizes, whether couples, lone travellers or larger families with children. The main restaurant at Guacimeta Apartments serves breakfast, lunch and dinner and a poolside bar is also available serving a great selection of drinks to lounge by the pool with. The hotel is also within easy walking distance from several great restaurants, where you can find a great selection of global dishes, from Asian to Mexican dishes and a children's menu to suit even the fussiest of eaters. The First and Last Irish Bar is a great spot serving British and Irish favourites whilst Sirocco Restaurante combines a menu to please all with views across the sea to really set the atmosphere as it should be. 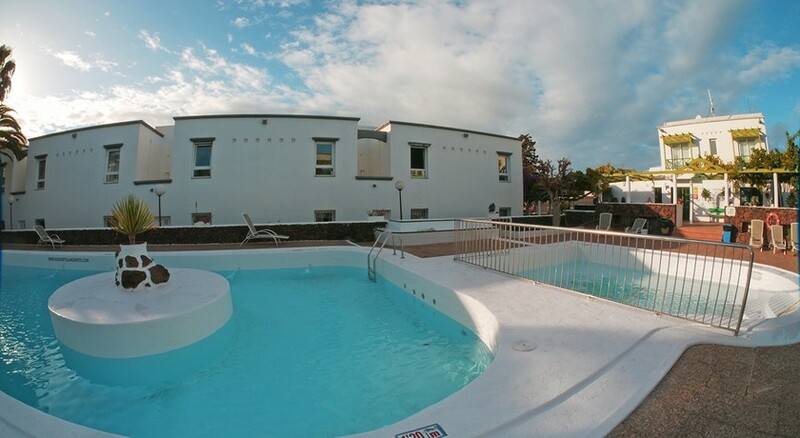 It is easy to relax at Guacimeta Apartments when you can take a dip in the heated swimming pool or meander through the gardens filled with native plants. Venturing away from the hotel you can find a host of water sports on offer such as water-skiing, scuba diving and parasailing among others. A day trip to Timanfaya National Park is a great opportunity to enjoy the inspiring natural beauty sights that have been formed by ancient volcanic activity. 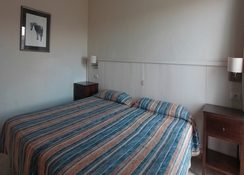 Great base for a beach holiday in Matagorda. Apartment was good, clean and plenty space. 10 min walk from beaches and shops etc. Staff friendly and helpful. We took self catering option and supermarkets close by. Local restaurant's have lovely and cheap specials daily. Would definately return.